Rolling down the highway west of Shiprock NM, I feel a certain degree of wonderful familiarity about all this. Sorta like making love with your spouse: perhaps not many surprises, but enjoyable nevertheless. I have done this approach drive with most of the trip participants many times in the last few years. I don't tire of it, (mainly cause George is driving) and there is always some sense of anticipation. But it is very familiar. But enough philosophy. Let's start at the beginning. We left Knoxville yesterday on the 5:15 flight to Atlanta. Pretty uneventful for us. Will and Barbara M. had flown out on Thursday evening, so as to give them time to do their necessary urban thing, like jogging, bookstores, and veggie restaurants. I had received an email from Andy about 3 hours before we left warning me that the weather in Austin was very bad, and he was concerned about getting to ABQ on time. That concern turned out to be valid: A&S were supposed to reach ABQ about 5:30, but when we got there, they still had not arrived. Ginny Payne had not received any calls from them, but after some checking with Southwest, we learned that they would soon be in. Which they were, sans luggage. So after some deciding about what to do (Will at these times likes to throw in a lot of alternatives. I think it is a hold over from his lawyering - he wants to give his clients the opportunity to have many options open to them. Probably works great with them, but when decisions need to be made quickly, it can be somewhat frustrating for me. But then, I am sure that my desire to come to a rapid decision is pretty frustrating for him, and we haven't shot each other yet, so if it ain't broke, don't fix it.) Anyway, the cost of renting a third car would be less than throwing away $360 on motel reservations in ABQ, and given that SW did not have a clue as to where A&S's luggage was, well, it just made a lot of sense for the main crew to move on. I made a promise to Andy that we would stick with the hiking itinerary until they caught up with us, no matter what. I was concerned that they would have to play catch up for 3 or 4 days, and I wanted them to know that we were concerned about their situation. So we packed up the van and the minivan, and headed for Gallup, about 45 min behind schedule. Because we got to Gallup so late (after midnight) we sort of made the tacit agreement that although we would shoot for a 7:30 departure time this morning, the world wouldn't come to an end if we ran behind. I guess that was the excuse that most of us needed: all but Susie and I went out to breakfast at the Village Inn. Bottom line that with extended bathroom stops prior to departing the motel, and gas stops, and snack stops, we didn't get out of Gallup until maybe 8:20 am. I admit to some degree of frustration at this point, but also recognize that I am a little compulsive about time. Drive up to Mexican Hat was uneventful, and George really put the hammer down to make up for lost time. We crossed the state line into Utah at 11:48 am. Lunch at the San Juan Cafe was great. I had a burrito this time and it was wonderful. But I was still frustrated, because I called Ginny Payne, and she said that she really had not heard anything that she could understand from Andy and Sue. But definitely nothing about their leaving ABQ. So I was bummed out about that. We stopped up at the Kane Gulch ranger Station, and learned that East Slickhorn Canyon was a little brushy in the bottom (the rangers call it Point Lookout), and that water should not be a problem. We were told that there was a good size party right ahead of us going in the same direction down to the San Juan River, and that the use of Cedar Mesa has increased by a factor of 10 in the last 5 years. 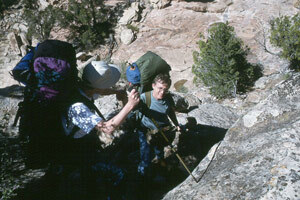 It has become evident that there will need to be some kind of a permit system for backcountry use on the Mesa. The rangers provided us with a survey to fill out, and let the BLM know what we thought about various approaches to the permit system, which will likely be a lottery system. The road out to the trail head was a little rough, but not too bad. We got to the trail head for Access 4, which is just a small turnout right before the road crosses the draw that starts the canyon, at about 2:07 pm. There was a little trickle of water already in the wash. A great omen! Of course, they had rain and snow about 2 days ago. Temperature was cool, in the mid-60's. It took about 45 min to run the car shuttle, so we really did not start hiking until about 3:15 pm. The wash deepens a little right away, but the floor is pretty flat. Then after about a mile and a half, the canyon just dives. As you are walking up to this point, you can see in the near distance that the normal rubble at the bottom of the walls is no longer visible, so you know you are in for some serious elevation loss. 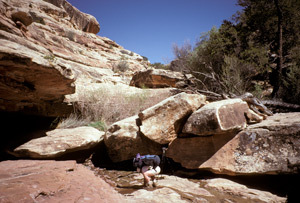 We negotiated several good size pour-offs and room sized boulders, and picking our way through the rocks was not fast. This goes on for about a third of a mile. Then the floor bottoms out, and begins a more gentle course. This is classic canyon country on Cedar Mesa. Great walls, wildflowers, and a small stream in the canyon bottom. Susie and I stopped about 4:40 pm for a break, and Lance, Ray, and George got way ahead of us, so I figured it would be Ray picking out the campsite as usual. But we caught up to them about 5:20 or so. They were in a small meadow. Susie was not ready to stop again, and we knew we had at least 3/4 of a mile to go. If the 3/4 mile was as rough as the dropping section that we had just passed, we could see getting into camp about 7 pm. Right after we passed them, we got into a marshy area. We could see a path leading off to the right, but the main path crossed through some marshy brush, and kept on heading down canyon. Immediately, the canyon bottom opened up, and we were walking on hard rock or sand benches. We were flying, but I could tell that Susie's batteries were running low. Jet lag and the time zone change can have big impact on your ability to hike, and she was falling a little behind. 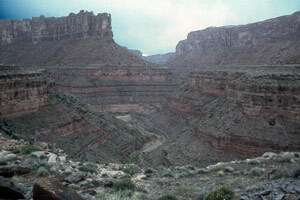 But then I could see the walls of the main canyon, and I knew were at the confluence. On the west side of the confluence, there was a huge bench (several acres) which had been our intended camp. So in this rare instance, I was the first to camp at 5:45 pm. A strange feeling indeed. We kinda wandered around this multi-acre bench for a while, trying to find an ideal place to camp, with no cacti. But none was to be found, so we just took a lot of care in selecting the best place for our tent. The neat part about the site was the set of huge rock faces all around us, the nice trickle of water in both creeks (the main actually had a little less than our access canyon. There was a nice rock bench for cooking on about a hundred yards from our tent (Lance elected to sleep there.) And to top it all off, there was a great bathing spot, with a nice rock slab with the creek running across it, just downstream from our camp. Susie and I took off to there as soon as we got our tent up. We enjoyed a nice ecologically sound bath in the early evening sun, the canyon running east-west at this particular point. We got cleaned up, and headed back to our tent. I went to get water at about 7 pm, sorta waiting for the remainder of the crew to show up, hoping that Andy and Sue would be able to at least get to the trail head before dark. As I was getting the water near a 4 inch pour-off, I heard some voices, and looked up. Not only were Will and Barbara pushing thru the last line of brush, but Andy and Sue were there. Seems that they had in fact picked up their baggage in ABQ about 8:30 am, and made a bee-line for Cedar Mesa. Sue had gotten stopped for speeding, keeping her lead-foot reputation alive, but a Jim Chee wanna-be let her off with a warning. So all the chicks were in the nest! We all cooked dinner up with Lance. As it got dark, we went over across the main creek and watched the Hale-Bopp comet under slightly hazy skies. A great end to a fine day. The frogs croaking signaled that it would not be a cold nite, but it was cool enough for sleeping.